Clare grew up in a castle in Italy with everything a thirteenth century girl could want, but Clare wanted to belong to God. At eighteen, she heard Francis of Assisi speak. Like a sponge, she soaked up everything he said and watered the seed God planted in her heart with Francis' words. He recognized in her a kindred spirit and the two became holy soul mates. Clare stole away at night and ran to where Francis was waiting. He cut her long blond hair as Clare made a simple vow to belong only to Jesus. She clothed herself in the rough brown tunic and black veil that Francis brought for her. This was the beginning of the Poor Clares, a contemplative order who live an enclosed life of prayer and silence. They rely solely on Divine Providence. The world supports them physically and they support the world spiritually with their prayers. Their religious rule, which Clare wrote, was the first written by a woman. She worked alongside the women who joined her, inspiring them by her holy example. 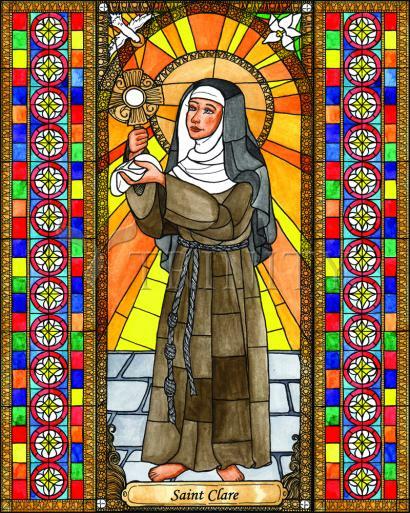 She drew strength from Christ in the Eucharist. Her feast day is August 11. At 18, she escaped one night from her father’s home, was met on the road by friars carrying torches, and in the poor little chapel called the Portiuncula received a rough woolen habit, exchanged her jeweled belt for a common rope with knots in it, and sacrificed her long tresses to Francis’ scissors. He placed her in a Benedictine convent, which her father and uncles immediately stormed in rage. She clung to the altar of the church, threw aside her veil to show her cropped hair and remained adamant. Sixteen days later her sister Agnes joined her. Others came. They lived a simple life of great poverty, austerity, and complete seclusion from the world, according to a Rule which Francis gave them as a Second Order. Francis obliged her under obedience at age 21 to accept the office of abbess, one she exercised until her death. Contemporary accounts glow with admiration of her life in the convent of San Damiano in Assisi. She served the sick and washed the feet of the begging nuns. She came from prayer, it was said, with her face so shining it dazzled those about her. She suffered serious illness for the last 27 years of her life. Her influence was such that popes, cardinals, and bishops often came to consult her—she never left the walls of San Damiano.